The outdoor HD TV antenna is designed to receive digital TV UHF/VHF signals while providing high quality 1080 P HD picture. You can enjoy high definition television without the high cost of monthly cable fee. With a built-in rotor, Turn a full 360 degrees using the infrared remote control. Perfect solution for any rural or suburban areas. Outdoor TV antenna can be omnidirectional receive signal with 360 degree rotating, you can pick up TV signals with much better reception than with a regular fixed or rabbit ears outdoor hdtv antenna. 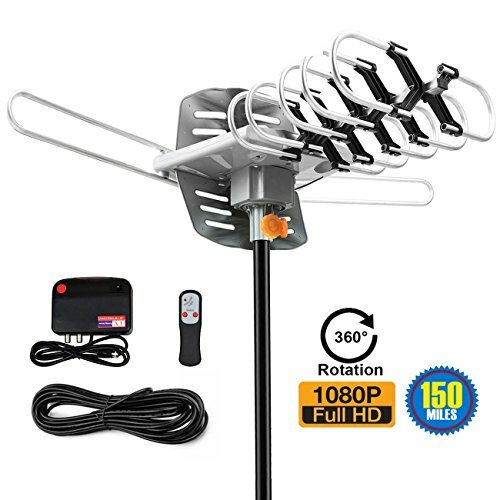 WIRELESS REMOTE CONTROLLER -- Antenna Built-in 360 degree motor rotor | Built-in Super Low Noise Amplifier | includes 33ft hdtv antenna coax cable. The pole is not included. WHAT YOU GET -- Pacoso outdoor HDTV antenna with wireless remote, power supply adapter and 33ft coax cable.Together with 45 Days Money Back, One Year Guarantee and Friendly, Easy-to-reach Support.